For her fourth outing as director Anne Le Ny brings to the big screen a charming, romantic comedy based on one of the staples of French cinema – the love triangle. (Le Ny was Yvonne in the huge French hit movie Les Intouchables). 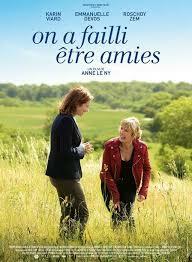 On the surface, On a faille etre amies revolves around the story of two women vying for the affection of the same man, but Le Ny digs deeper and the true emotional heart of the film is the relationship between the women. It’s a funny, insightful., laid back look at the nature of female relationships – a subject often ignored by French filmmakers.